Cary, N.C., January 28, 2009 - Fast Lane, a leading worldwide provider of advanced IT training, has been named by TrainingIndustry.com as one of the Top 20 IT Training Companies for 2008. Fast Lane joins such prestigious organizations as IBM, HP, Red Hat, Microsoft and Cisco on the select list. Training Industry reviews companies that provide IT training services and conducts assessments to determine suppliers' experience and capabilities. As part of their commitment to the industry and service to their community members, Training Industry announced its annual list of "Top 20 Companies in the IT Training Industry” to help buy-side organizations searching for the right training partner. 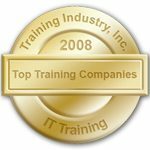 “We are pleased to announce TrainingIndustry.com’s First Top 20 List for the IT Training market. IT Training represents one of the largest content segments of the training industry. According to the 2008 ASTD State of the Industry Report, IT Training accounts for as much as 10% of corporate spend for learning services. Our list of Top 20 companies highlights the best in class organizations focused on the IT skills marketplace. TrainingIndustry.com’s review committee worked to ensure for a comprehensive view of the IT training sector to include tools, equipment and software training companies that demonstrate outstanding capabilities in the design, delivery and management of training services. Companies recognized are those that focus on the business of learning and lead the pack in their approach.” Doug Harward, CEO, Training Industry, Inc.